FRANCESC MASSO is ABARI's technical consultant, from Spain who is operating the earth lab. He graduated in Architectural Technologist from the University of Girona in 2013 and did his Masters in Sustainable Building with Earth from Foundation University of Girona, in 2014. He started in straw bale construction and traditional wooden structures (Traditional Timber Frame). He is a Research Fellow in the University of Girona’s Department of Architecture and Construction Engineering. He is also a founding member of the NGOs Moviment Nomada and Terram, based in Spain and also an active researcher for CATS (Construction: Advanced Technologies and Sustainability) University of Girona group of research. Francesc has been awarded with the Patronat Politecnica Final Degree Projects award in the Architectural Technologist modality (2014) and awarded with "Jovenes Promesas" (Promising young) award from the VII Ecologic Building Conferences: ECOARK(2014) for the project "Tapial de Corcho Natural" (Rammed Earth with natural cork). He is also a teacher at Bioconstruction Master of University of Girona Foundation (2014). After the 25th April, Nepal earthquake,Francesc, decided to come to Nepal and help. In the course of his volunteer work for Nepal, Francesc met Nripal Adhikary. Francesc and Nripal realized they had the same ideologies and values with regards to construction, using Earth and Bamboo. They would meet each other from time to time and also work on projects together and began collaborating. They soon realised the need to make an earth lab. 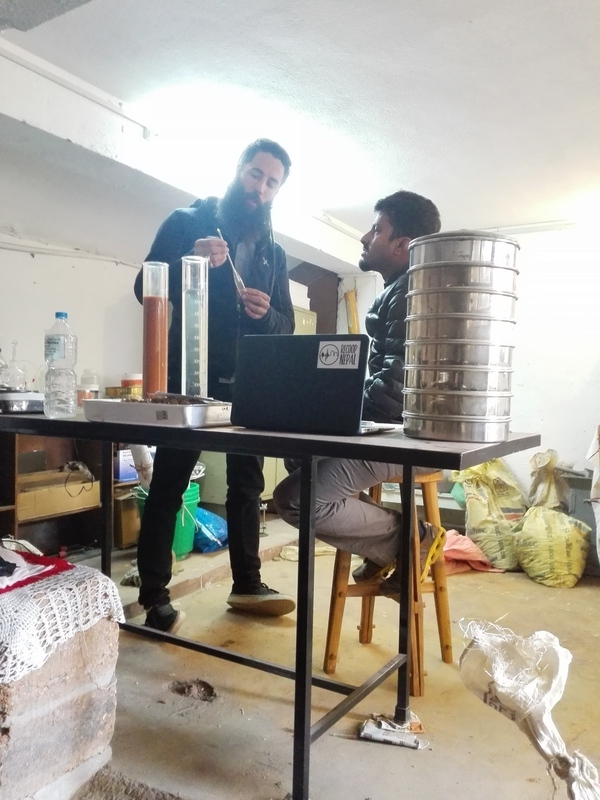 ABARI, already has an MOU with Kathmandu University (KU) to use their lab for various soils and sample testing.For the preliminary, testing they decided to establish a lab at ABARI's office in Kathmandu, whose samples will be further validated at the KU lab in Dhulikhel. There are 2 major tests for soil/earth that have to be conducted. An initial Analysis Test where loose soil collected from the site is tested for particle analysis and its quality to build with. The second test is conducted after the tested soil is put to use and given time to dry/form/stabilize in its created nature. Even though Lab does the initial test only, that’s more than enough to get data about progressing to the next step of building or not. Gravel/Sand/Stone Dust are also analyzed. The lab can not the test for conclusion of materials and products but can definitely make sure that the materials are worthy before they are used (the first step of the test). Therefore we can do the tests and come up with the best composition to build with, which can be further tested in university lab. Francesc Masso hopes to share knowledge about Earth Architecture to the people and organizations that are in need and involved in this traditional and innovative technique of building and living. He stresses on how people might hesitate to think of Earth and Bamboo as a safe and secure building material in the long term but it is not the materials that play the most important role in building as it is the design of the building itself. He hopes to help this issue by focusing on Training on Site, helping builders also learn about the reasons why we build with these materials. Francescc and ABARI are in total agreement about the usability of Earth and Bamboo as a cheap alternative for the world's marginal population and also the use in contemporary architecture due to the materials renewable, environmentally friendly and passive build properties.